In the pantheon of White Rock Lake, he is the court jester. 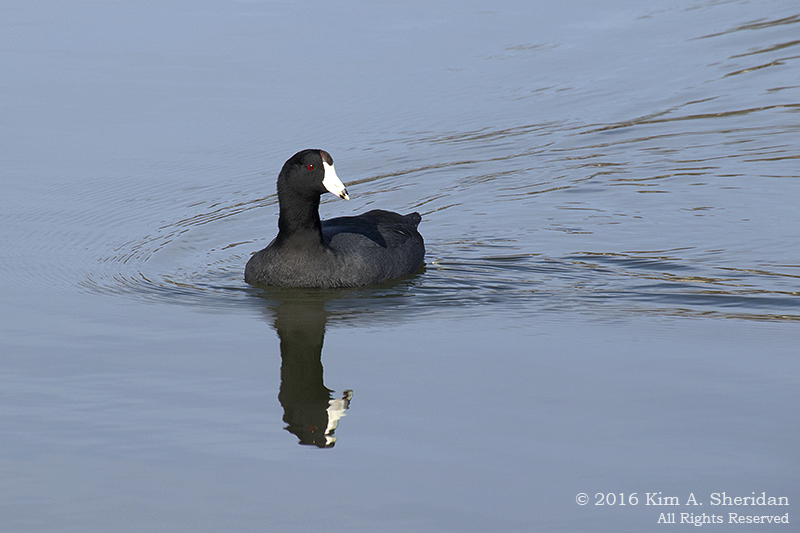 Black of body, red of eye, white of bill, the American Coot is a plain-looking water bird that can’t figure out where he belongs. On water he swims and dives like a duck; but he isn’t a duck. Consider the Coot. On land he doesn’t waddle, but walks like a chicken. He’s sometimes called “Mud Hen” and his shape resembles a chicken; but he isn’t a chicken. In the air he’s awkward – but first he has to get there, a challenge for the coot. He takes off by running for a long way across the water while flapping his wings, like a loon; but he isn’t a loon. Other birds don’t think much of the Coot. Double-crested Cormorants, undeniably snooty, look down their bills from lofty heights at the Coot. 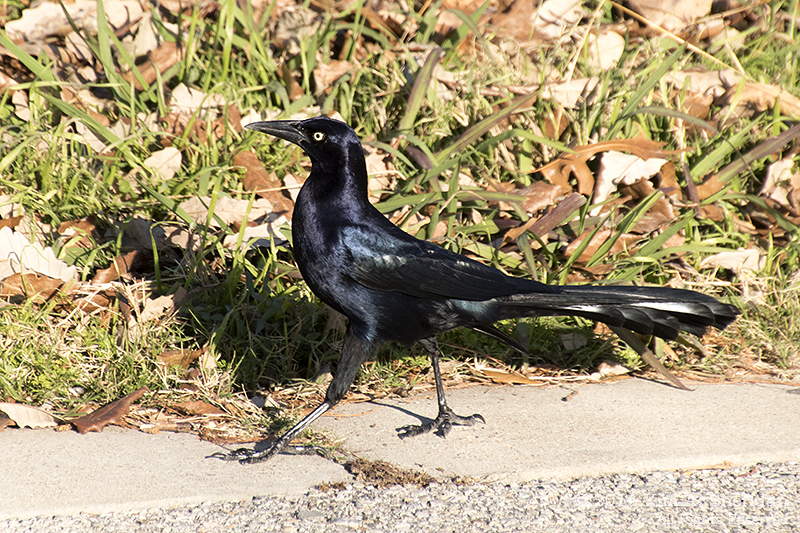 Great-tailed Grackle struts, smug in the knowledge that he outshines the Coot. 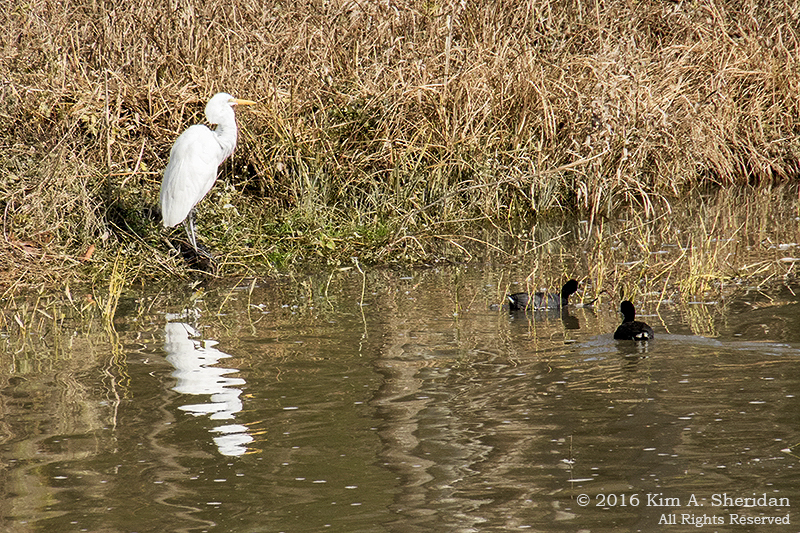 Great Egret is studiously cool, ignoring the Coots. Yes, the bird royalty treats the Coot with disdain. Not so the squirrels. 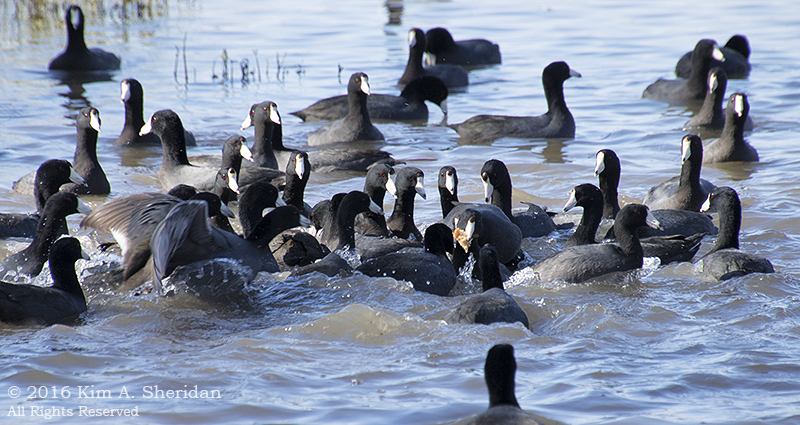 They think the Coot’s a little nuts. Perhaps this is why. What sensible bird would hurl himself at a wall of rushing water 5 times his height – for fun?!? Yet that is what the Coot does, over and over again. 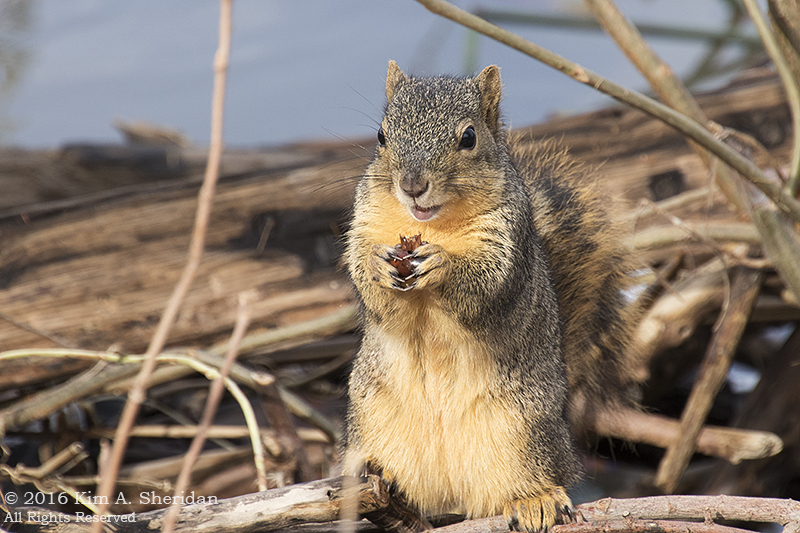 He walks up the face of the dam spillway until the water knocks him tail over teacups and washes him down the stream bed. Then he walks up and does it again. It’s whitewater kayaking, coot-style. 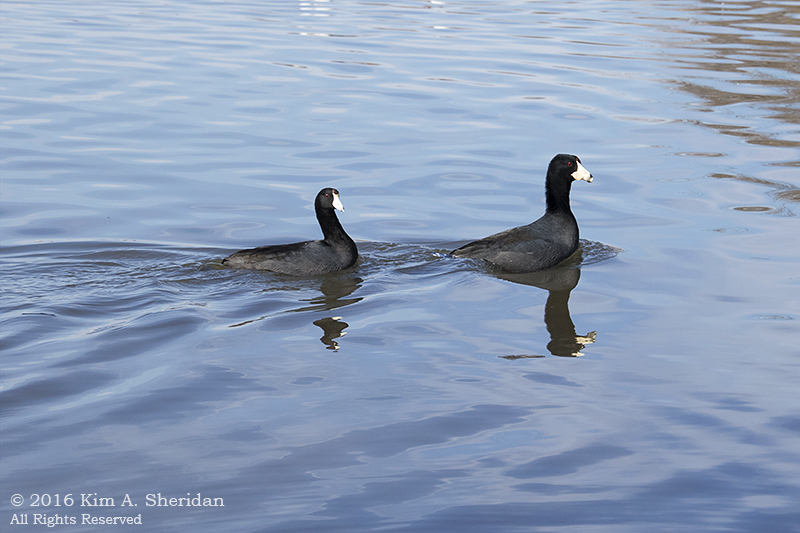 FUN FACT: The American Coot is most comfortable on the water, but his feet aren’t webbed like a duck’s. Instead they have long toes with lobes of skin that propel him through the water. The same lobes keep him from sinking into mud when he’s on shore leave. 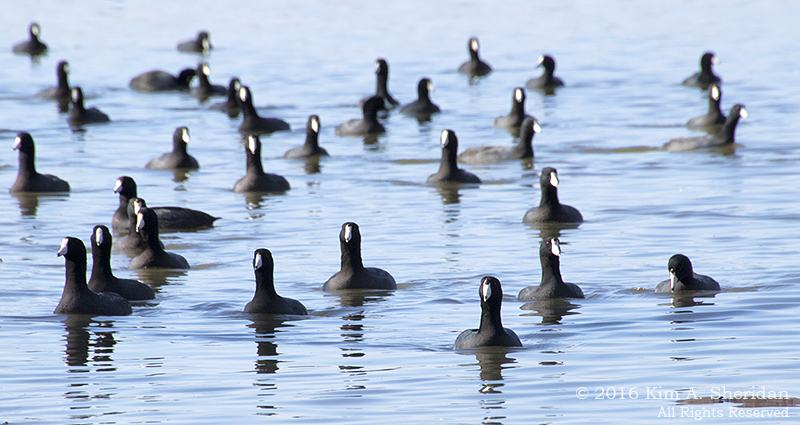 Look out, here come the Coots! 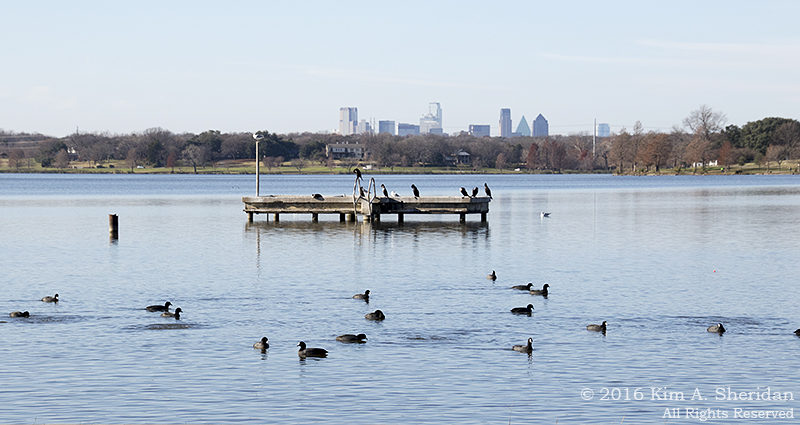 White Rock Lake is a large park in a highly urban area. Lots of folks come down to the shore with bags of bread for the “ducks.” What they get is Coots. Consider the Coot. 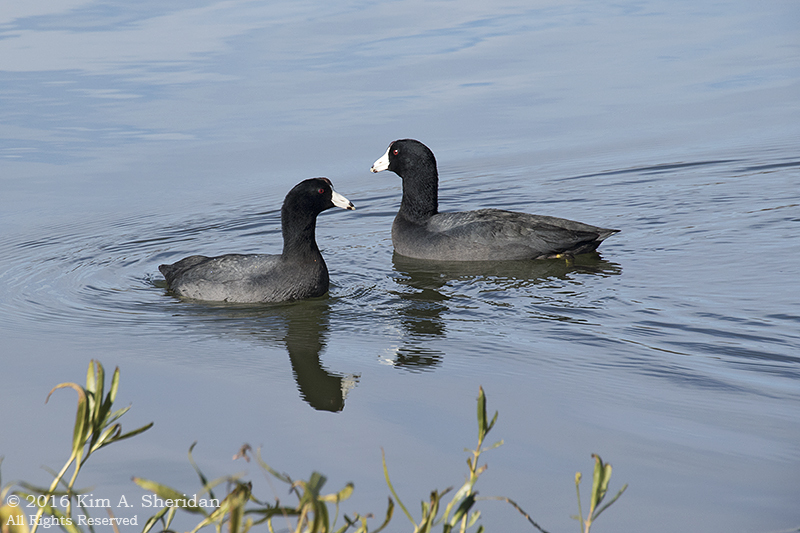 The Coot is a rail; rails are usually known for their secretiveness. But he’s a noisy gregarious bird that hangs out in large flocks in the open. Which squabble over every bit of junk food tossed their way. Other birds think this behavior unseemly. Little do they know how magical, how wondrous, it is! An audience of young urban children is enthralled with his comedy routine. They giggle at his antics, and shriek with delight. For many of them, the park is a rare escape from the noise, the congestion and the concrete of their neighborhoods. The Coot is their first connection with wildlife. If even a few of these children grow to love and defend wild animals and wild lands, it will have started here. In this urban park, in the heart of Dallas, on the wild edge between man and nature. The promise of the future rests on the wings of the clown prince of White Rock, the American Coot. 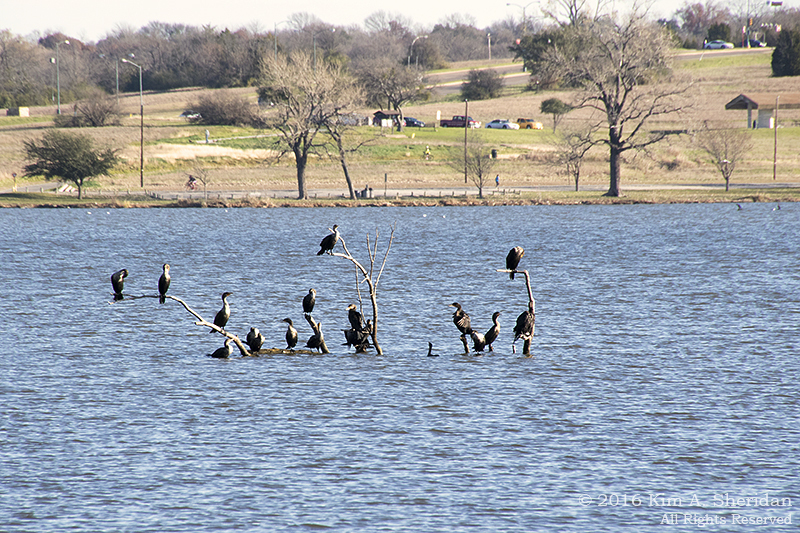 This entry was posted in Birds, Texas and tagged Birds, Dallas, Nature, White Rock Lake, Wildlife by Kim. Bookmark the permalink. Great! 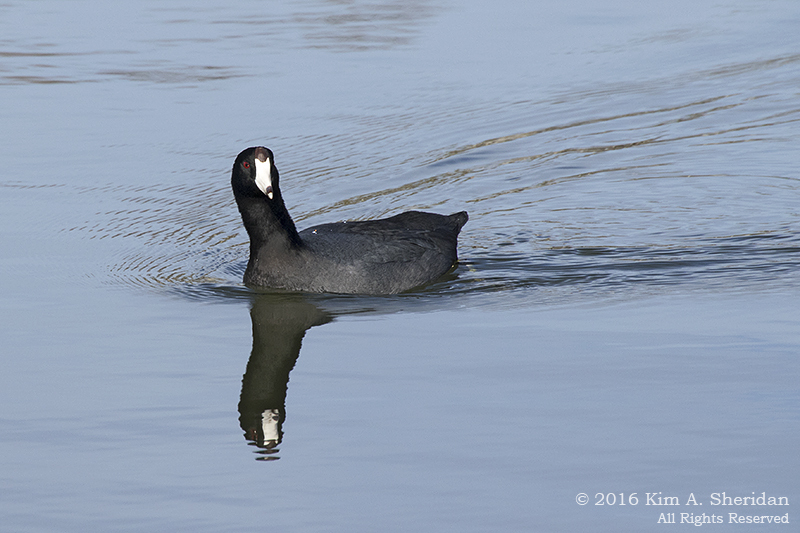 I love coots, but they’re often overlooked for showier birds.